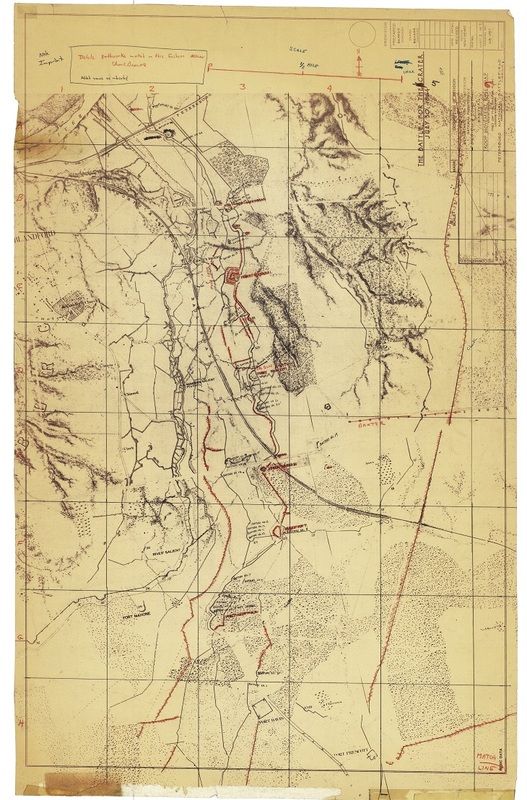 A few days ago I shared the news that I had finally obtained the detailed troop movement maps Ed Bearss created for Petersburg National Battlefield. In that post, I shared several zoomed in sections of the first map focusing on the October 27, 1864 Battle of Boydton Plank Road. There are over 60 maps in all, including around 10 or so base maps, and then accompanying troop movement overlays. The maps were scanned at a diagonal angle, meaning they need to be rotated, cleaned up, and then overlaid properly. My lack of artistic talent meant this process would take a long time, in addition to the work I’m doing behind the scenes here preparing for the Ninth Offensive in March-April 2015. Since the original post, I’ve luckily recruited some help. Rich Hasenauer, a retired graphic artist who has moved on to creating Regimental Fire and Fury scenario books in his newly expanded free time, has agreed to lend his considerable talents to this project. He has managed to finish the maps for Boydton Plank Road, the Crater, and Hatcher’s Run in just the last few days alone. Although I’m still sticking to my timetable of releasing these one per day starting in mid-April 2015, I will at least whet your appetite in the interim. Today we are going to take a look at a few scenes from the July 30, 1864 Battle of the Crater, part of Grant’s Third Offensive against Petersburg. First, I want to note that the Crater base map isn’t as “clean” as the Boydton Plank Road map I zoomed in on previously. Here we have a note written and signed by Ed Bearss which explains that earthworks marked with red zig-zags did not yet exist at the time of the Third Offensive. Keep this in mind as you look at the rest of these images. With that clerical note out of the way, let’s take a look at several portions of the Crater map series, consisting of 1 base map and 5 troop movement maps. 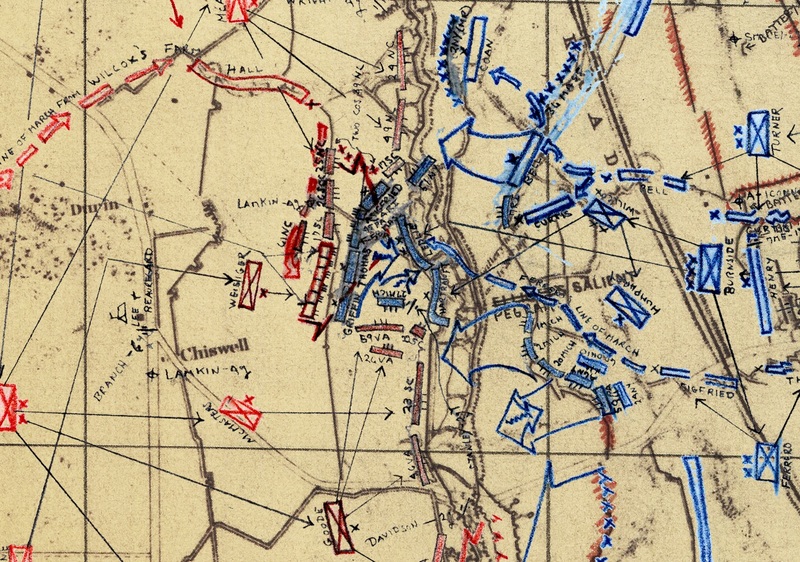 Next, let’s look at the position of the troops near what was about to become the Crater at the time of Henry Pleasants’ mine explosion in the pre-dawn hours of July 30, 1864. 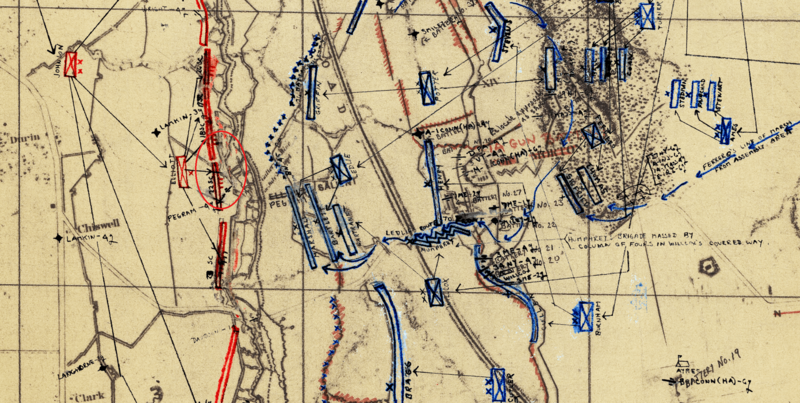 Mr. Bearss has noted on the map: The Crater, Sheet I: Troop Positions at the Moment the Mine was Detonated. I’ve VERY approximately placed a red oval in the area which represents the Crater. Note that I’ve also purposefully left this map at a very large size so you can click on it and examine the troop positions in detail. Lastly, I wanted to take a look at the map representing the attack of Weisiger’s Virginians, which is, other than the mine explosion itself, the most famous moment of the battle. Note the ravine the Confederates used to file south and get into position for an attack very close to the Federal lines. Feel free to click on the map below and explore the detail. This is only another small snippet of a massive amount of data. Stay tuned for more “previews” in the coming weeks, and be sure to check back in mid-April for the full maps, available in several download sizes. In fact, if you’re planning on following along, you might want to subscribe to my RSS feed via email or in an RSS feed reader and get updates delivered to you. If there are areas you’d like to see for the upcoming Hatcher’s Run set, feel free to comment here or Contact us privately.